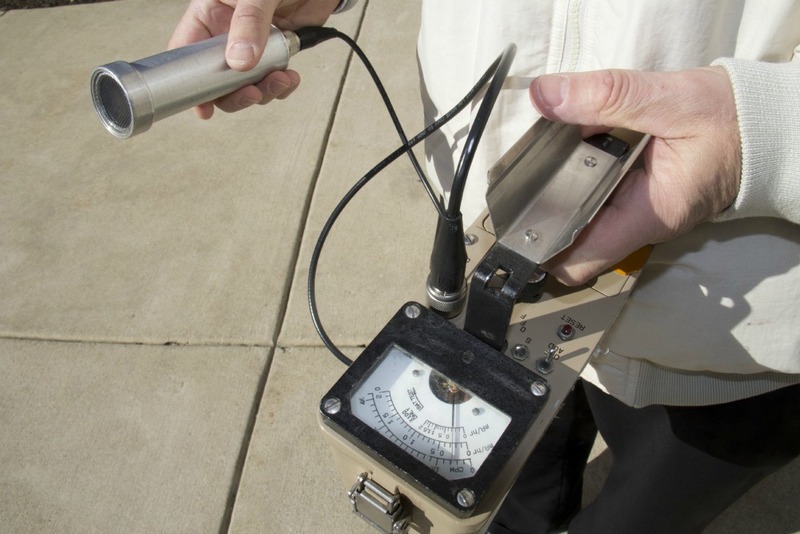 Did a WWII nuclear experiment make the U of C radioactive? An artist's rendering of Chicago Pile 1. The first ever self-sustained nuclear reaction was conducted under the University of Chicago’s Stagg Field. Is that site still radioactive? Mark suggested we find someone with a Geiger counter to take a measurement, so we took him up on it. I joined Marsicek in the Administration Building, about a block away from where Stagg Field used to sit, and we took a control reading there. As Marsicek fired up his Geiger counter, he explained that “there’s radiation all around us, naturally occurring.” This “background radiation,” he said, will usually measure anywhere from about .02 to .03 millirems per hour on a Geiger counter, and indeed, when we looked at the Geiger counter’s needle, that’s where it landed. From the Administration Building we walked about a block north, stopping near a bronze sculpture designed by Henry Moore that commemorates the first self-sustained nuclear reaction. This spot is close to what used to be Stagg Field, so Marsicek took another reading. The needle again registered .02, the equivalent of normal background radiation. We walked about fifty yards away in the direction of a library building and took another measurement. Same thing. As we left the memorial and the site of the former reactor, we passed a student giving a tour. “Over here was where the first sustained nuclear reaction took place,” he explained. 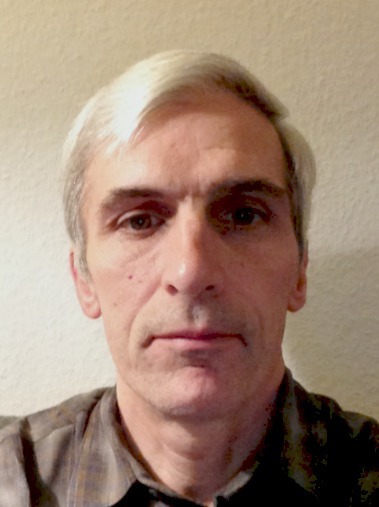 Before long, he added, “Don’t’ worry, it isn’t dangerous.” Apparently, Mark’s question is on others’ minds, too — seven decades after the experiment ran. With the help of technology we can breathe a sigh of relief; there’s no undue danger in this corner of the campus, at least not from radiation. But, like I said, the nuclear reactor in question was primitive. So ... were the safety precautions from that time primitive, too? And, why would Fermi risk the chance of any nuclear mishap at a Chicago university in the first place? For several weeks in the winter of 1942 Fermi’s scientists and laborers toiled in the unheated squash court underneath the University of Chicago’s abandoned football field, building what was named “Chicago Pile 1.” They called it a “pile” because that’s what it was: a pile of uranium pellets and graphite bricks, stacked ever-so-precisely. It was so cold most days that technicians and scientists could see their breath. They tried building fires in trash cans, but the room filled with smoke. The pile, which would eventually grow into a spherical shape, was built in meticulous layers, and the men (and one woman) worked in twelve-hour shifts, day and night. Directing the whole operation – his lab coat black with graphite dust – was a physicist named Enrico Fermi. Just three years earlier, some of Fermi’s contemporaries, including Albert Einstein, had urged President Franklin Roosevelt to commit the United States to building an atomic bomb before Germany could. Physicists believed that by splitting uranium atoms they could create a chain reaction and release immense amounts of energy, the likes of which had never been seen. Top-secret research projects were started around the country, including the one at the University of Chicago led by physicist Arthur Compton. Fermi directed the experiment. When Fermi began his work at the university, physicists had never witnessed a self-sustained chain reaction. They had crunched the numbers, of course, but no successful experiment had proved what the math had only suggested. Fermi, who had escaped from his native Italy with his Jewish wife, was known as a hands-on physicist — just the person for testing this theory in a real-world experiment. Fermi’s pile was remarkable for its crude simplicity; it had neither mechanical parts nor wires. Instead, the pile consisted of alternating layers of uranium and graphite. Basically, it was just a stage to let the uranium do its thing: emit neutrons that would occasionally strike the nuclei of other uranium atoms, thus splitting off even more neutrons. The graphite served as a moderator, which would slow down the neutrons and make them more likely to strike additional uranium nuclei. The pile was to become a giant beehive of neutrons buzzing with atomic life, but scientists could quash this activity by manipulating the pile’s only moving parts: cadmium rods. The element cadmium naturally absorbs neutrons, so when the rods were in place, the nuclear reaction would almost stop. To get the reaction going, scientists could pull the rods out of the pile and let stray neutrons buzz freely, striking more and more uranium nuclei. The team was aiming for criticality, the point at which, if you removed the cadmium rods and let the pile go, the chain reaction would continue exponentially on its own. The team built the pile slowly; with each new layer Fermi would withdraw the cadmium rods and take a count of neutrons before placing the control rods back in the pile. As the workers and scientists milled more and more graphite, their faces grew black as coal miners’. Neighbors complained about the noise, not just from tools, but from the men singing to distract themselves from the monotonous work. The pile grew into a black igloo, 25 feet across at its equator and 20 feet tall from pole to pole. 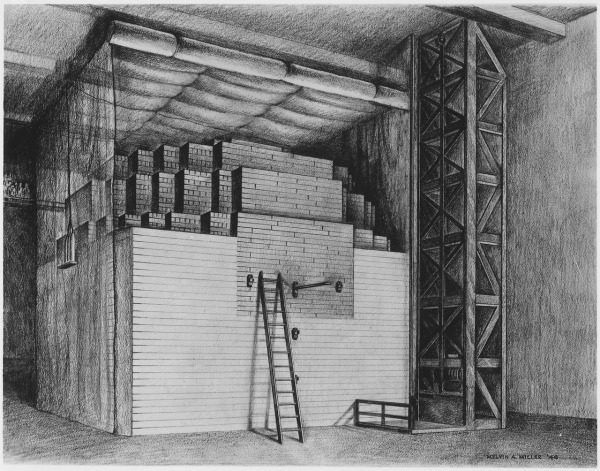 After 17 days of adding layers, Fermi knew the pile was big enough to reach criticality. Couldn’t they do this in the woods? Chicago Pile 1 was never meant to be under the University of Chicago’s former football field. Project managers originally wanted the full experiment to run in the Red Gate Woods, southwest of the city. But builders at Red Gate went on strike, so Compton and Fermi faced a decision: abandon the experiment, or move it. Fermi told Compton he felt confident that the pile could be built safely and effectively in the squash court under Stagg field. The physicists I consulted about the 1942 experiment assured me that this was, in fact, a very low-risk experiment and that university physicists today routinely work with higher levels of radiation. This crude reactor could never have exploded like a bomb, which would require highly-enriched uranium. The worst-case scenario for the Chicago experiment? A primitive meltdown, with the pile catching fire and the uranium spewing more radiation. Compton trusted Fermi, enough so that he chose to move forward with the experiment at Stagg Field without telling the University’s president. “The only answer he could have given would have been no, and this answer would have been wrong, so I assumed the responsibility myself,” said Compton in his memoirs. On Dec. 2, 1942, Fermi ordered the last cadmium control rod removed from the pile, took a measurement, and declared the pile to be self-sustaining. And then, for a nerve-wracking 15 minutes, he let the reaction run its course while the neutron counters beeped out of control. Fermi and his team celebrated the achievement with muted enthusiasm. One of the scientists had brought a bottle of Chianti and they passed it around, drinking out of paper cups. According to Rhodes’ account, no one made a toast. No one said much of anything at all. Eugene Wigner, another physicist on the project, recalls his realization of the far-reaching consequences of the event. The world&apos;s first nuclear reactor was rebuilt at this site in 1943 after initial operation at the University of Chicago. This reactor (CP-2) and the first heavy-water moderated reactor (CP-3) were major facilities around which developed the Argonne national laboratory. This site was released by the laboratory in 1956 and the US atomic energy commission then buried the reactors here. The grave isn’t easy to find – Google Maps will lead you only to an unmarked trail-head and, after you arrive, you’ll find no sign saying “Nuclear reactor this way.” (This map below will help you on your adventure.) But if you&apos;re a little weak-kneed about visiting or you feel uncomfortable hitting up the stray jogger or hiker about the pile’s ultimate demise, you can find details and a museum-like tour at the nearby Argonne National Laboratory.